50gram. Mix vegetable of your choice. – Marinate the pork belly in the salt, ground black pepper and sugar for at least 30 minutes. – Preheat the oven at 250 Celsius. – Put 1litre of water in the pan, bring it to boiled then add 100grams of the pork belly.Add the light soy sauce, fish sauce, oyster sauce, oxo cube and honey, ground pepper, spring onion and coriander. Simmer the broth in the same time whilst roasting the pork or approx 20 minutes.Remove the cooked pork belly aside. – Cook the rice vermicelli according to what the package instructed. – Flash fry the chopped garlic in the oil until the garlic become golden colour. – Pour the hot garlic oil and mix with cooked rice vermicelli. Then in goes the mix vegetable.Transfer this mixture into the serving bowl. 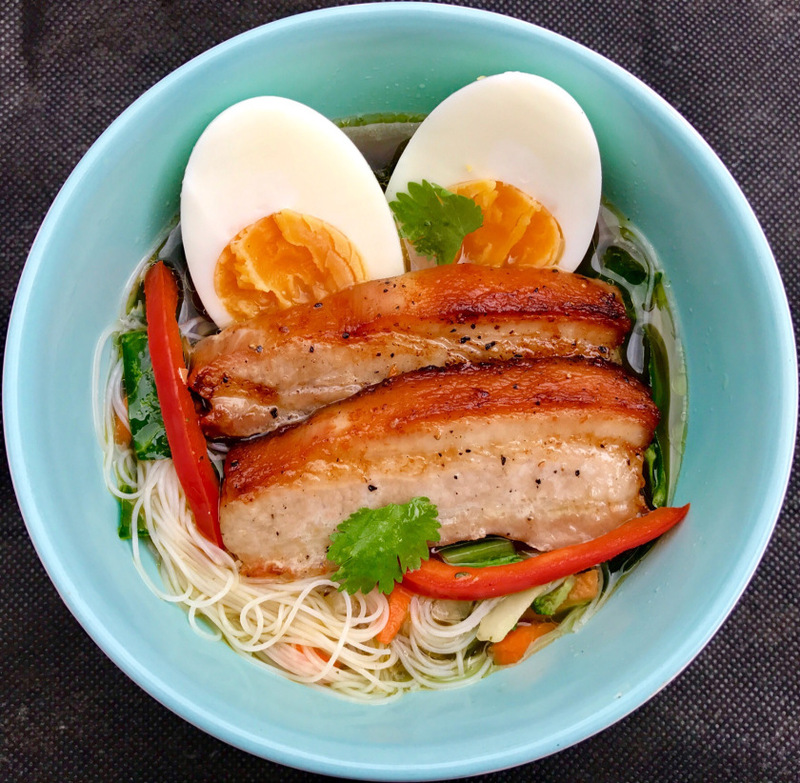 – Assemble the cooked pork belly on the top, add the boil egg and pour in the broth. -Add the left over juice from the pork belly tin in the broth for the special intense flavour. 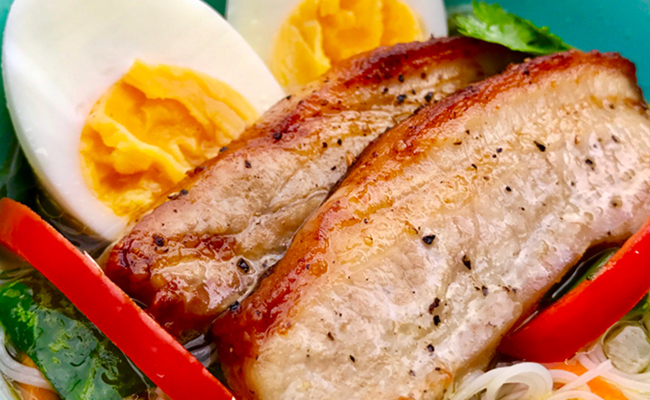 -Enjoy this easy Thai recipes , Roast Pork Belly Noodle Soup immediately after you finish to cooking, as the rice noodles can absorb the liquid and increase in volume.